Our industrial themed favors including tin favor boxes and tags are an affordable way to add urban chic style to your industrial inspired theme. If you're looking for gifts for guests that match your wedding's edgy, urban industrial theme, you'll find an enticing batch of them at Weddingstar. Our industrial-themed wedding favors keep the ultra-modern vibe of the theme alive while giving guests a tangible and delightful memory of the rustic event. 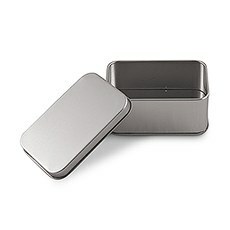 Tin is a prime metal of choice for the industrial set, and we have two tin boxes your guests are apt to adore. 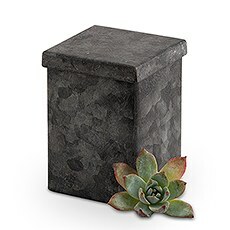 One is a small tin favor box with aged finish, which promises to look stunning when displayed on your wedding favor table. The other is a small rectangular tin box in a silver color, with a hugs and kisses message inside the bottom of the box. Both boxes come with an included lid, and both work fabulously for sending guests home with a batch of wedding candies or treats. 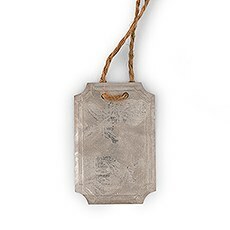 Tin tags are another way to infuse your wedding with a touch of industrial chic. 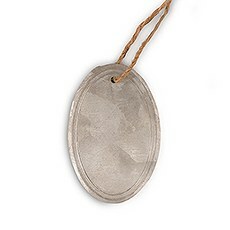 The rectangular and oval tin tags both come with jute hangers for easy attachment to your wedding favors or whatever you wish. 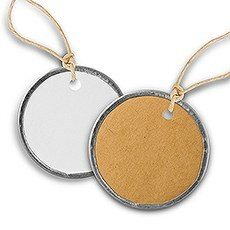 A round, metal-rimmed tag is another option that can serve as a gift or place setting label. Personalizing the tags is as easy as writing on them with a black marker, giving guests a message of thanks for inking their name so they know where to sit. While tin is big in industrial themes, it's not the only material that gets a nod in our wedding favor collection. 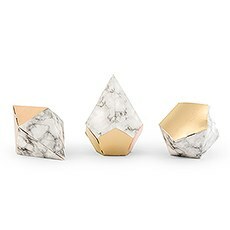 Another favor box option is designed to mimic the appearance of marble, magnificently contrasted with gold foil. These boxes sport a striking geometric design, giving any table an elegantly intriguing look when displayed as wedding decorations. The best part is, your guests can take these decorations home, stocked with your choice of candies or treats. Check out Weddingstar's full line of industrial-themed wedding favors so you can mix and match your favorite options today.